Material:/b> Child-safe premium filler EPP. Safety: This is a material that is physically foamed without using chemical insulation foaming material and is safe enough to be used as food packaging material. It is a material that does not detect dioxin when burned. High elasticity, high function: EPP material is used as a car bumper and has excellent durability and strength. The resilience is excellent and the life of the filler is drastically extended, so it can be used for a long time. Personalized variant creatives: EPP granules are dispersed according to the bending of the human body and wrapped around the body tightly, so kids can feel comfortable cushion feeling even when using for a long time. A comfortable sofa where children can sit comfortably. A large donut sofa in a small cylinder, leaning obliquely, and sitting in a sink, it is a nice and comfortable donut sofa complete! 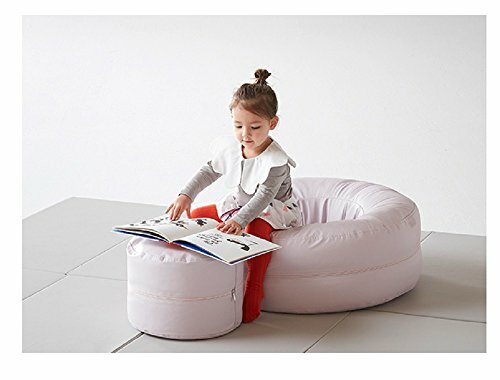 Tables and chairs where children can see books.Donut sofa turns into a chair when you use a small cylindrical as a table. Safe play tools that children can play with fun. Donut Sofa with a variety of physical activities, such as rolling a sofa or running as a jumper.